We are delighted to report some great news from our trip to Cuba. During our stay one of the places we visited was the National Cuban School of Music. 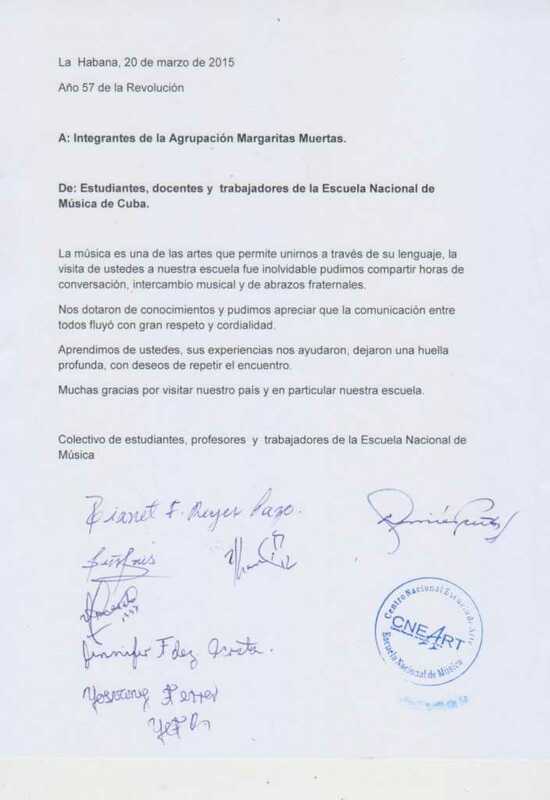 We have received a really wonderful letter and some photos from the school thanking us for our visit in which the band not only watched the students perform, but also jammed with some of the students as well as spending time with them, giving them advice from their own personal and professional musical experiences. 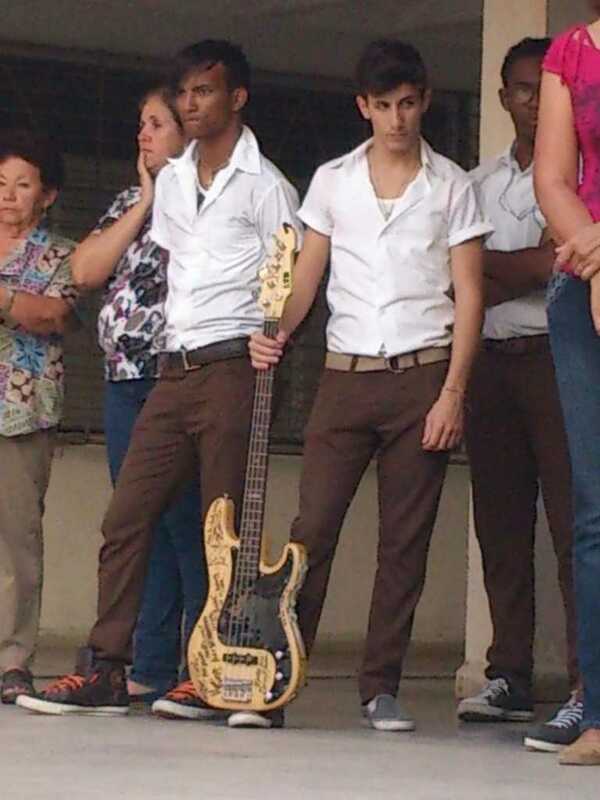 We would also like to thank the ESP Bass Guitar company and Marco for generously donating a bass guitar to the school. 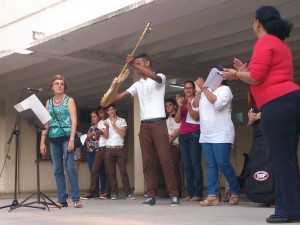 It was signed by the band and was recently presented to the students in their school yard, during their morning routine, the president of the student federation talked about the encounter with the band, then the school principal read the thank you letter that was signed by three students from each grade in representation of the school. Music is an Art form that allows us to Unite through its language, Your Visit To Our School was memorable , we were able to communicate through Musical exchange and Fraternal Hugs. You gave us so much Knowledge and we could appreciate communication between all of us that was evident with Cordial Respect!! We learned from you, and your experiences left a deep Footprint, with the Desire to repeat your visit again!! Thank you so much for Visiting our Country and in particular our School! Marco said of the letter and time spent with the students, “As soon as we arrived the school, you could feel the Tension , anticipation, what to expect?…. walking into one of the classrooms we were received with the warmest applause and smiles that would touch you in a deep way. We were blown away with the amount of talent in that room, first with a cello quartet and then with a Jazz quartet, the exchange and the energy in the room was overwhelming, we wanted to leave a momentum a gift to mark the event and maybe something saying that we would be coming back, so THANKS TO ESP Bass Guitars we all Signed and donated the BASS That I brought to CUBA. 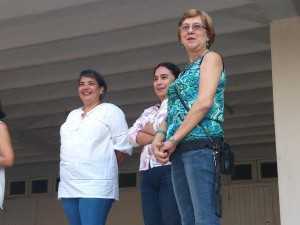 We look forward to visiting the National Cuban School of Music and Cuba again soon!